The CPEC306 with EasyFlux™ is a turn-key, closed-path eddy-covariance (EC) flux system for long-term monitoring of atmospheric-biosphere exchanges of carbon dioxide, water vapor, heat, and momentum. 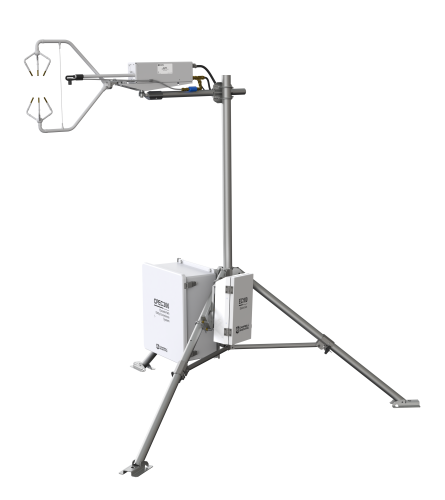 A complete system consists of a closed-path gas analyzer (EC155 closed-path gas analyzer), sonic anemometer (CSAT3A sonic anemometer), data logger (CR6 datalogger), sample pump, and accommodations for a CDM-A116 allowing for additional sensors. The CPEC306 has two enclosures: a fiberglass enclosure that houses the CR6 datalogger, pump module, and optional CDM-A116, and the EC100 enclosure for data processing. The pump module, a standard component of the CPEC306 system, consists of a small dual-head diaphragm pump with a brushless dc motor mounted inside a fiberglass enclosure. An integral cable connects the pump module to the CPEC306 system enclosure, which provides power, temperature measurement and control, pressure measurement, and pumping speed measurement and control.